A team-based, cooperative Mass Effect FPS fell to the wayside as BioWare shifted its team and basic structure to Mass Effect 3's multiplayer mode. If you think about it, it seems like Mass Effect 3 has largely deflected its criticisms by coming up with even more polarizing issues. The game's ending drowned out a lot of the bile about day-one DLC, which itself largely silenced complaining that multiplayer had no place in the final installment of the space opera trilogy. Although the fanbase is much quieter about the Galaxy at War mode than it was a few weeks ago, it may get noisy again when it learns where the generally well-received multiplayer matches came from. An ill-fated spin-off called Mass Effect Team Assault would have brought competitive, class-based, first-person shooting to the series in the form of a downloadable game. Instead, as expectations for Mass Effect 3's multiplayer shifted, it slowly transformed into the coop skirmish mode we all know and love/despise. META was in development for four months around the beginning of 2010, and got far enough in the development process to have video of gameplay footage that features very familiar locations and weapons. The game's central mechanics share some similarities with ME3's multiplayer: Squads of soldiers, human and alien alike, would take up arms with a number of different class-based weapons and abilities. However, matches were not entirely cooperative. While players may have been able to team up, fighting other players - an impossibility in ME3 - would have been a feature of META. In fact, the game would have been something more in line with Battlefield 3 or Unreal Tournament 3 than Gears of War's Horde mode. 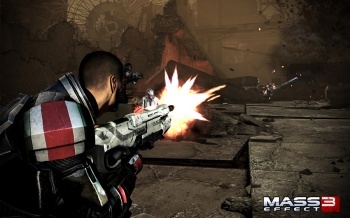 After BioWare realized that the current Mass Effect engine made integrating cooperative gameplay into the single player all but impossible, it transitioned the META team away from the FPS title and into the core ME3 multiplayer. BioWare did not want to let cooperative play fall by the wayside, since it felt that a galactic war would be an appropriate time to ask players to team up. Would Mass Effect multiplayer have worked better in its original form? BioWare is probably not done with the series just yet, so the galaxy might find out someday.